It’s hard to beat going to an island from another island – layer upon layer of end points and start points, liminal eddges, and ferry boats. With our weather continuing to be outrageously gorgeous, here are a few photos from the most recent expedition to North Uist, Benbecula and Berneray (Harris). When you holiday in the edge places of Scotland and Ireland, you have to take pot luck with the weather. Sometimes you draw a short straw and get a week of rain. Sometimes you’re plagued by wind. Sometimes the mist comes down. Mainly it’s mixed of course, and you just learn to take what comes. Sometimes you get lucky, and are blessed with days of sun. My last trip was one of those times. Day after day: clear skies, sunshine, turquoise water, bleached white beaches, and not a soul in sight. 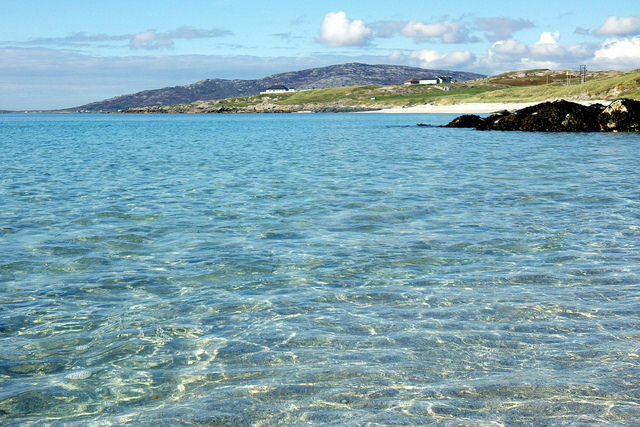 Photos from the islands of Barra, Vatersay and Eriskay. The long grass is soaking between the graves at Cille Bharra. A late spring, only the yellow of primroses on the slopes above the cemetery and dotted gaily round the stones. We move slowly, reading dates and names. In the centre of the graveyard: three tiny chapels. Bending low into the doorway, a single light illuminates the rough hewn walls. Rain squalls outside, a battery of wind – the distant sound of chanted prayer, and still the touch of water, pooled in the curve of a stone. Blinking back into the light, we find his grave. I had thought it would be more: some lines about his work, or the stories, a plaque perhaps to that Whisky Galore! but after all it’s only this – a name, and dates: the beginning, and the end. The writer Sir Compton Mackenzie, author of many books including Whisky Galore (the inspiration for the much loved film of the same name) is buried in Barra, the island that he took as his home for many years. His gravestone is in the ancient churchyard at Cille Bharra, near Eoligarry, in the north end of the island, one of the few places in the UK where you can still hear a corncrake.